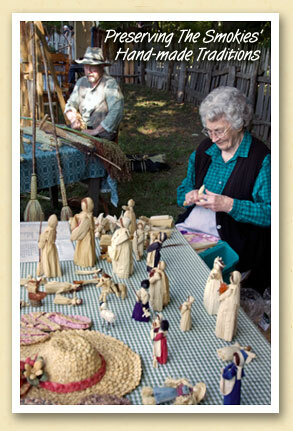 Today, handmade brooms and corn-shuck dolls are collectable crafts. But a century ago, in the Smoky Mountains of remote Appalachia, they were just two staples of everyday life – necessities for house-cleaning and entertaining the children. Fortunately, such heritage crafts have not been lost over time. David Higgins, a Whittier broom maker, grows his own broom corn from heritage seeds. And he gives the corn silks to Annie Lee Bryson to use as hair on her handcrafted corn silk dolls. Above, David and Annie demonstrated their crafts at the 2008 Mountain Life Festival at the Mountain Farm Museum in Great Smoky Mountains National Park. In Bryson City, their brooms and dolls are available at The Cottage Craftsman.